Several people asked me about Grenelda Thurman after reading last week’s blog . I forget that not everyone knows who she is. She is a fictitious character first introduced in Living On Purpose in 1988. Grenelda Thurman is the one who is living your life when you are not paying attention. She can pop in for one-time distractions or she can be running the show for extended periods. We often take things and ourselves so seriously that we get all scrunched up. Noticing that Grenelda has shown up serves two purposes. First, Grenelda serves to help you see that you have fallen asleep in your life and that your mind is going in many different directions at once. Second, noticing that Grenelda is active in your life helps you lighten up and not take your foibles, missteps, or downright bone-headed actions quite so seriously. We somehow have the mistaken belief that if we are hard enough on ourselves that we will shape up! That simply doesn’t work. The question I would ask you is – has this strategy worked for you so far? I love Grenelda because I have a history of being hard on myself and any of you who know me very well at all will be shaking your heads and saying, “Yup.” The beauty of Grenelda is that I don’t have to continue to frame myself as wrong, stupid, careless, or that I should have known better. I can lighten up and move on. Now, I can hear some of you saying that I’m not taking responsibility for my actions and I beg to differ. It doesn’t mean that I am disregarding the goofy stuff I have done, I am simply shifting my focus to realizing that if I had been fully present in my life that I wouldn’t have done that. Here are some examples. Grenelda was the one who was living my life when I toasted the optional pine nuts for a recipe. I love pine nuts so I opted to include them. I put some on a baking sheet to toast them and proceeded to have a conversation at which point I smelled the pine nuts burning, oops. I threw them out and put more pine nuts on the baking sheet and put them in the oven. I continued my conversation standing right there in the kitchen and once again smelled pine nuts burning. OK, I had enough pine nuts to try yet one more time. Yes, you guessed it – I burned them a third time. If you cook, you know that pine nuts are pricey so this was not a little oops. Luckily for me, I recognized that Grenelda was running rampant at that moment and that I wasn’t paying attention. So, that dish did not have the optional pine nuts and we all opined that “it was just the way we like it” which is a saying taught to me by my dad. The lesson was, next time turn on the timer because I can’t rely on my not being distracted by a great conversation! I want to add a few more thoughts about the above story. It seems fairly innocuous and you may be shaking your head wondering why I repeated this action three times without setting a timer. The answer is, who knows? The lesson is that I can change my action next time and I don’t have to spend any time at all beating myself up for not paying attention. You know that I could have let that ruin the rest of the evening, brooding about the dumb thing that I did. Grenelda truly does lighten things up. Many years ago when my kids were little I loaded them into their car seats to take them to swimming lessons. I noticed that the light was on inside the car, but didn’t do more than notice and proceeded to back out of the garage. I then heard a sickening “crunch” as the back door hit the side of the garage. I had left the door ajar. I got out of the car, looked at the damage to the door, shut the door, and got back into the car to head off to swimming lessons. There was no upside to creating a big drama about “how could I have done that?” so continued on and took care of the problem when I got home. If I was fully present I wouldn’t have backed out of the garage with the door ajar. It was a wake up call for me that I had way too much on my mind and it was time to get my mind and body in the same place. Grenelda is a way to recognize when you have gotten too serious or too busy. I’ll bet that you have some Grenelda stories and I would love to hear them. Oh, you may be wondering why I chose the picture at the top of the post. It isn’t quite a Grenelda story, but still makes me laugh. 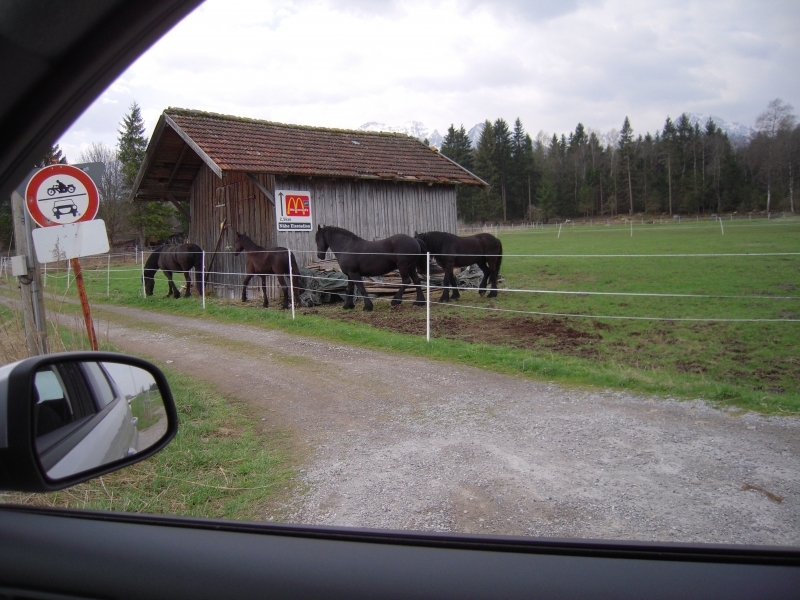 I was driving in Bavaria a few years ago and put my destination into the GPS. It should have been a straight shot and yet here I was on a dirt road rather than a highway. I loved the little sign on the side of the barn out in the middle of nowhere and rather than get anxious about being on the backroads, decided to go with the flow, laugh at the absurdity of it all and arrived at my destination taking the scenic route. PS Grenelda will be making an “appearance” at Journey Into Self beginning September 9th. Are you ready to let go of the drama, need for perfection or self judgment and lighten up to create more space for you to be who you truly are? Learn how Grenelda can help you do that. Contact me at Cindy@PurposedLives.com if you’d like to have a conversation to see if this 6-week program, Journey Into Self, would be right for you. 3 Responses to Who is Grenelda Thurman? Grenelda in MY life? You have to be kidding! Tonight I asked my husband if he’d like to be taken out to dinner since I have no desire to cook (most of the time).I gave him the choice of Houlihans or China Bistro…He picked Houlihans on Randall Road in Algonquin. We’re listening to an audio tape of one of James Patterson’s novels…so we got into the car, turned on the tape and headed to Houlihans. Hah! Glad that you liked the book and dinner even if it wasn’t what you had intended. That reminds me of a time that I made plans to meet a friend at that restaurant that we met at last. Needless to say, we ended up at two different restaurants. She remembered the one we met for lunch and I remembered the one we met for dinner, oops.